Here is a store bought watering system, and one I made in action. Here is a feeder in action. Here are the parts, apart from the jugs needed to make it work. Here are a pair of jugs ready to go, one with water and the other with food. Here is the jig. Very important tool. 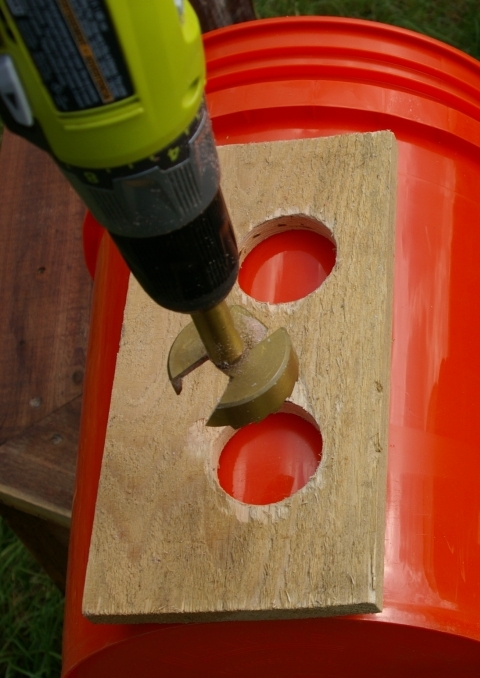 It lets you space the holes at the right height, make and even spaced pair, and even make sure they are spaced evenly around the bucket. A note on spacing around the bucket. The more slits, the less structure the bucket has. It needs some curved walls to remain strong. The examples here may have too many slits. The ones in the chicken pictures, have three sets of two slits. This allows for decent structure. A bad chicken can block the water for the rest of the chickens, so multiple slits are needed however. 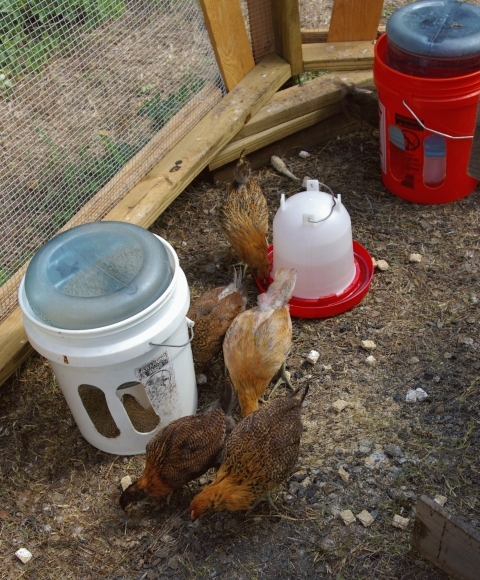 I put two food buckets and two water buckets in with a coop of chickens to make sure they are ok. Here is the setup to drill the slit holes. The drill can grab and run, so I run the drill backwards to scrape a hole instead of cutting. It still works pretty quickly. Here is an example of where the drill can run off track quickly. 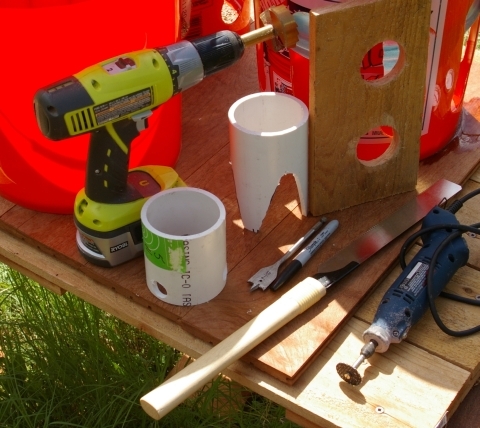 Be sure when you drill, that you are safe, the area is clear, the bucket is secure in place, and that in the worst scenario, you cannot be hurt. After drilling holes, this is how I connect them. Here are the food and water stands on the jugs, ready to be put in the buckets. The stands are made from nice big pvc pipes. Here are the food and water buckets on the jugs, ready for inversion. The whole point here is to be able to have a lot of food and water available when I am gone for the weekend. This allows the chickens who have to stay cooped up, to stay healthy and happy. » Chicken Feeders, More Details Toolmaking Art: Timeless Tools, Speculation, Husbandry, Making hand tools. This is a good idea guys! I found it at google image search and going to suggest my brother to use this method :). Cheapes and simplest method. NICE! Glad to be of service! Be sure to check the update, http://toolmakingart.com/2008/10/07/chicken-feeders-more-details/ I made a few simple improvements that really make a difference. Cool stuff! Your feeder seems quell one of my concerns of the chickens wasting food with there beak or scratching, problem solved. I wonder if you can make the slots narrower to make the waste problem even smaller? I constructed the water system described here with only two holes and it seems to keep the water cleaner between refills. The design itself is an excellent system, thanks for the design. Higher Bottom of the hole is the best way to reduce waste. Birds have been known to block others just out of spite, so narrow holes can lead to issues. I have lower holes for young chickens and prefer higher ones for the older ones. A cover, and higher bottoms on the holes seems to do the best for keeping the water cleaner. Thanks very much for these ideas and pictures, great! I am part of a small group of people who have come together online and on the ground to assist a teenage boy living in the slums of Kampala, Uganda, to set up a very small scale chickens business. We are collating links and information that we hope will be of help not just to him but to others who keep chickens on a small scale. Adding a link to this page in our ‘Useful Links’ document in our Facebook group, ‘Arnold’s Chickens Enterprise’, you are welcome to view and join if you wish! How do you keep the water from freezing in the Winter time? Will pipe heat tape work? Is it a hazard? OR would it be better to use a light bulb in a metal pan under the bucket? Which would be less costly? way to go bob, and thank you for sharing this idea and solving my problem for me. thanks matey good idea ive got some of these bottles from my cooler they will come in handy for this cheers. How do you keep the chickens from eating the whole bucketload in 1 morning? I have never had that problem, but my chickens have a short life and give me so much, I don’t know if I could bring myself to restrict their diet. Where did you find the water bottles? You can buy a 5 gallon bottle of water to get one, or get one where they have a water refill machine. This is wonderful design, we use a float for the water, but have problems with the chickens standing in the trough and fouling the water,(they love to wash their feet, lol) May be able to figure a way to adapt the float. Thanks for the great design and the food for thought. Thanks Bob for sharing this great idea of yours! I found the link to your design on the Backyard Chickens forum. The instructions and pics made it so easy to make. 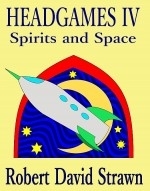 This is an absolutely wonderful design that is working perfectly for us. Since the bucket has handles, it also make moving the food around so much easier. I know what the wife is getting for her birthday! Thank you so much for this tutorial!!! The hubs and I just made one for our flock from your design. It was super easy and works great! Thanks again for sharing! Could you hang these from the rafter in the coop? I have tried the 2 gal bucket with the tray on the bottom, and the PVC type. I still have too much waste. These look like they may work. Thanks for the great idea, I tried the feeding bucket and my chicken like it very much. But I have some trouble with the watering system, they don’t drink in it. I don’t want them to dehydrate so I keep using a simple bowl beside the bucket, but i would really like them to drink in the watering bucket. How do you make them drink in it? I love this. 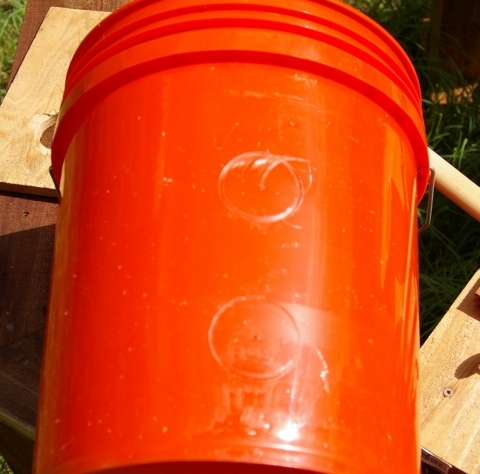 I would not use wood in the bucket in heat it creates bacteria and disease. Since the bucket waterer must be cleaned to ensure the health of both birds and people..thanks for the your practical and compassionate idea here Bob. Do you have any issues with field mice with this design? WOW I not only love it but I feel kind of slow for not figuring it out myself. Just thought I would let you know that I have loosely followed your plans here for my rabbit colony and it works great!! Thank you so much for posting this, it’s really helped me out. To see it in action, here are a couple pics.